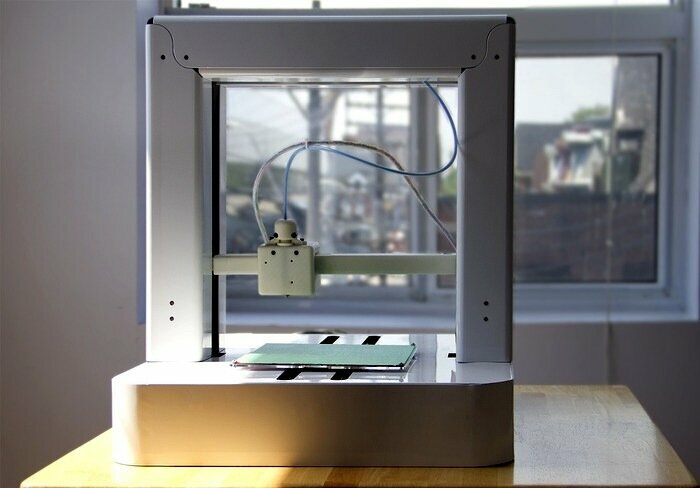 The timing could have been a bit better for the launch of the new PandaBot Home 3D printer, as it appeared on Kickstarter a week after the astoundingly successful launch of the Formlabs Form 1 3D printer, which has already sucked nearly $2 million out of 3D printer buyers’ pockets–with 25 days of fundraising still to go. But, the PandaBot looks to be an awesome printer in its own right, and is also doing quite well, having raised over half of its $50,000 goal in a matter of days. Surely this wil end in a successful crowdsourcing project. You’re really starting to see 3D printers moving away from the rudimentary Tinker Toy look and towards beautiful, sleek machines. And they should look good, even futuristic. I think I’ve heard once or twice, that 3D printers are the future. so let’s at least build them to look like they don’t come from the past. While I wouldn’t say the Pandabot looks futuristic or stunning, it does have a very clean appearance, designed with an enclosed print head, and with the major components hidden behind the white powder-coated, aluminum panels. It’s a nice looking machine, especially for just $800. 0.1mm Layer Resolution — The high resolution setting on the PandaBot Home 3D Printer easily delivers high quality results for all users. Large Build Volume — A build volume of 1331 cubic inches (11” L x 11” W x 11” H) provides enough space to create truly useful and delightful art and home objects.